Tripp Lite's 7.62 m (25-ft.) DVI Dual Link TMDS cable delivers the high performance, high bandwidth needed for todays digital video displays. Note: Review your monitor manufacturers specifications for a stated maximum DVI cable length. While many monitors only support a 5 meter (16ft) DVI cable, simply adding a Tripp Lite B120-000 DVI Extender will guarantee full digital signal strength at any length up to 45.72 m (150-ft.) Gold plated contacts ensure excellent conductivity, while double shielding (foil and braid) provides maximum EMI/RFI protection. Use in conjunction with DVI video cards that are specified as Dual or Single Link. Both DVI connectors are molded, have integral strain relief for long life reliability, and ferrite collars to drain off extraneous electrical interference. Connect a DVI Monitor or Display to Your Computer Over Distances Up to 25 ft.
Don't settle for less than the best—enjoy superior video and audio quality! 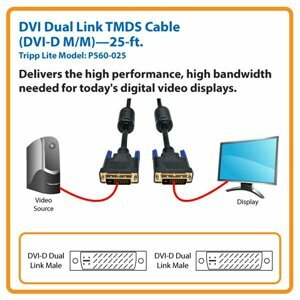 This 25-ft. Tripp Lite DVI Dual Link TMDS Cable assures peak performance when connecting DVI monitors, flat-panel displays or digital CRT displays and projectors to your computer. The P560-025 delivers speeds up to 9.9 Gbps with resolutions up to 2560 x 1600. Unlike cut-price cables, the P560-025 is manufactured to exacting specifications, using superior materials, for a difference you can clearly see. And we back our pledge of quality with a Lifetime Warranty. Note: Depending on the monitor, a DVI signal booster may be needed, such as Tripp Lite's B120-000. This genuine Tripp Lite DVI Dual Link TMDS Cable offers an easy, inexpensive solution for connecting a DVI standard monitor, flat-panel display or digital CRT projector to your computer over distances of up to 25 feet. Featuring two DVI-D male connectors, the P560-025 assures peak performance with no loss of signal quality. The P560-025 supports resolutions up to 2560 x 1600 with speeds of up to 9.9 Gbps and is compatible with any monitor, PC or Mac equipped with a DVI-D female CPU port. Depending on the monitor, a DVI signal booster such as Tripp Lite's B120-000 is recommended to guarantee full digital signal strength. The P560-025 is manufactured using top-quality materials. Premium double-shielded foil-and-braid cable with paired video wire construction provides maximum EMI/RFI protection and superior signal quality. The P560-025 features gold-plated DVI-D connectors with gold-plated copper contacts to ensure excellent conductivity. The connectors feature integral strain relief for durability and reliability. When you choose this genuine Tripp Lite cable, you get superior performance plus peace of mind! We're so confident of the quality of the P560-025 that we warrant it to be free from defects in material and workmanship—for life! The P560-025 is manufactured in compliance with strict RoHS specifications, reflecting Tripp Lite’s commitment to environmental responsibility.